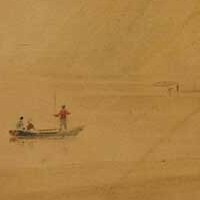 Irish Watercolourist, Antiquarian: Biography, Drawings, Paintings. Known for his watercolour painting and the precision of his drawing, George Petrie was a close friend of Francis Danby (1793-1861) and James Arthur O'Connor (1792-1841). In addition to his artistic skills, he was also an antiquarian scholar and archaeologist of the Victorian era. A member of the Royal Irish Academy, he became President of the Royal Hibernian Academy in 1857. Born in Dublin, the son of the portraitist and miniature painter James Petrie, he trained at the Dublin Society's art schools, where he won the silver medal for drawing in 1805. Initially, he helped his father with his works before devoting himself to landscape painting which he practised during several tours of the countryside. He also produced several portraits. Following a short visit to London to view the 1813 Royal Academy Exhibition, Petrie returned home and continued his travels, visiting Wicklow, Kerry, Offaly and County Dublin, during which time he produced numerous watercolour views. In 1816, he exhibited two landscapes at the London Royal Academy. A colleague of Frederick William Burton, Petrie was a prolific sketcher and found a wealth of subjects among the churches and monasteries of Ireland. In 1818, he visited the early Christian monastic complex at Clonmacnoise, County Offaly, completing over 300 drawings of local monuments. This contact with early Irish monastic culture inspired a lifelong interest in the antiquities and cultural history of Ireland, and his excellent draughtsmanship led to numerous commissions for illustrations in travel books and historical guides. In 1826, he began showing at the newly established Royal Hibernian Academy (RHA), contributing almost every year until 1858. He was elected an Associate Member in 1826 and a full Academician in 1828. In the same year he was elected a member of the Royal Irish Academy (RIA), and two years later, in recognition of his scholarly work on ancient Irish and Celtic architecture, he was elected to the RIA Council. In this capacity he revitalized the antiquarian work of the Academy, helping to establish the RIA museum and acquire countless antiquities in the process. As an artist, his forte was drawing - in particular, pencil sketches, drawings in Indian ink or sepia wash, and architectural compositions. In contrast, his watercolour painting, while much praised by his colleagues and friends, tends to be deficient in both colour and technique. One of his daughters, Mary Anne Petrie, went on to become a landscape painter and exhibited at the Royal Hibernian Academy. Petrie himself is now seen as one of the more important Irish artists of the 19th Century.  For the evolution of Irish drawing and design, see History of Irish Art.  For a summary of portraiture, see Irish Portrait Artists.